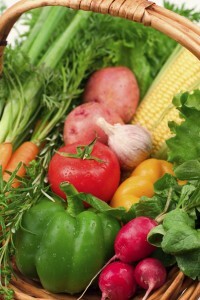 There has been a lot of debate over the recent years about organic foods. So the question arises: Should You Eat Organic Fruits and Vegetables? The levels of pesticides found in conventional fruits and vegetables are safe for consumption, as most of us have been eating them for years. And over those years the pesticides have become less toxic. Obviously, when ingested at large amounts, the pesticides can be fatal, but they have to be in large quantities. You are more likely to get sick not eating 5-7 servings of fruits and vegetables, then eating 5-7 servings of fruits and vegetables with pesticides. But if pesticides are a major concern, then I would recommend the organic route. These typically come at a higher price tag, but they will be pesticide free. The most important things to remember is that you need to eat more fruits and vegetables. If you have packaged foods that say organic, I highly doubt they will be better then a conventional fruit or vegetable. Eat fresh and stay healthy. While I agree with the premise of not getting enough fruits and vegetables may lead to health conditions that are concerning, I do not agree with the premise that it is okay to consume pesticides and herbicides. These chemicals not only are still toxic no matter how much someone says it is okay to consume them in small doses. Toxins build up in our tissues (mostly fatty/proteinaceous- ie CNS and organs) and have detrimental effects later on for some and more immediate for others. Lets also consider that “conventionally” grown food is grown on depleted soils and has maybe 1/50 of the nutrition that it had for our parents/grandparents’ generations. Lest we forget, the AAP is also the organization that pushes poison immunizations on our children. Are we really listening to what they are spouting about food quality? Great info, thank you very much. After re-reading the article I realized that it sounded as if I was in favor of pesticides. I am not in favor of pesticides, but I was trying to emphasize the importance of fruits and vegetables. I completely agree that organic fruits and vegetables are far superior, but I know some people are not willing to spend the extra money on them. I still think conventionally grown fruits and vegetables are better than packaged foods, crackers, or any kind of candy. Organic would be the best option, but in the end we all need more fruits and vegetables. Thanks again for the input.